* This is my column in BusinessWorld last July 02, 2018. — Isaac Newton (1642 — 1726) 3rd law of motion. My addition to the two related statements above is: For every government intervention and taxation, there is an equal opposite distortion. And this is what exactly happens with a series of franchise, price, and surge control and then the per-minute charge control policies of the Land Transportation Franchising and Regulatory Board (LTFRB) in its regulation of transport network vehicle services (TNVSs) and transport network companies (TNCs). When Uber exited Southeast Asia last April and was acquired by Grab, it had 19,000 Uber drivers in the Philippines. However, only 11,000 were absorbed by Grab because LTFRB only accredited this number. Until June this year, some 6,000 former Uber drivers were still waiting accreditation but LTFRB franchise control does not give them the chance. Some 2,000 ex-Uber drivers must have given up. As a result, after the acquisition, ride requests reached 600,000 per day on average, making it difficult for everyone — even previous Uber users — to get a ride. Second, price and surge control. Even when Uber was operational, LTFRB put a cap on surge pricing on both Uber and Grab to 2x, later down to 1.5x, and this resulted in passenger inconvenience as their waiting time to get a car during rush hours became longer. When the price is too low, the number of drivers to supply the demand is also low. A notice of “no cars available” shows up and riders’ waiting time to get a ride gets longer, if ever the car shows up. Which might mean cancellations of important meetings or inability to bring a sick person to the hospital. When the price is too high, the number of riders will decline, or they will take the regular taxi or cheaper but lesser-known (good or bad) companies. If the trip is not very important, they may choose to postpone their trip and wait until prices decline. TNVS charging P2 per minute is a mechanism to offset the big decline in surge pricing to only 1.5x. So even if the route and the pickup and drop-off areas have heavy traffic or are flooded, drivers will have additional incentive to take that trip. Abolition of per-minute charging therefore removes the incentive and hence, passengers will be unable to get a ride. These three ugly interventions and regulations by LTFRB are anti-commuter and directly contradict its stated mission, “Ensure that the commuting public has adequate, safe, convenient, environment-friendly and dependable public land transportation services at reasonable rates.” Cheap but not available service is not desirable. Now there is a fourth ugly intervention by the LTFRB. It disallows Grab the P2/minute charge but allows new players to charge that amount. Only about 2.7% of the commuting public use ride-hailing services, the rest use mass transportation (jeepney, bus, UV express, MRT, LRT) plus tricycle, trisikad, and regular taxi. Why is the LTFRB focusing on that segment? 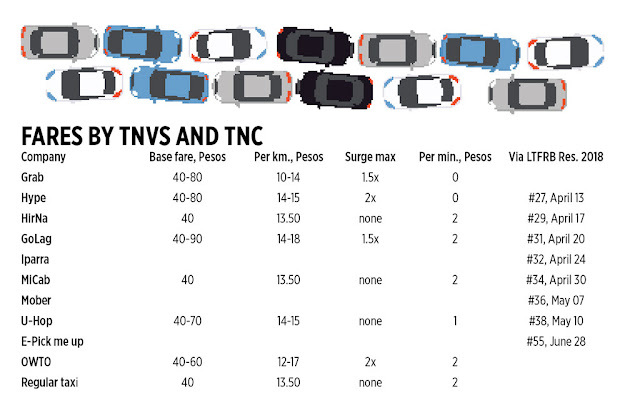 LTFRB should be ashamed of its franchise control, surge control, per-minute charge control, and TNC favoritism. It should reverse these policies. It should (a) expand the number of TNC drivers, (b) allow higher surge pricing, and (c) allow the P2/minute for all players, and not play favorites.